Check Health of Hard Disk: Imagine that you are working on a very important document. You are red hot nonstop writing and suddenly the hard drive of your computer gives you a heart attack and everything goes to hell. Only those who have lived know how that feeling of “It cannot be happening to me” that keeps you in shock during the first few minutes before you put screaming hysterically. Obviously, with the benefits of cloud or keeping backups every so often the drama could have been avoided. But neither would have been nice to have some tool to go occasionally checking the health of your hard drive. Checking the hard drive health is always the best thing to be done before starting any important work. CrystalDiskInfo is a complete tool that will show you information about the SMART parameters. The temperature, the serial number, the manufacturer, the number of times it has been turned on, the hours it has been running and a large amount of data referring to each one of your hard drives. It also analyzes the status of external hard drives. It also has a warning function that you can adjust to warn you when one of your discs is getting too hot. It’s an Open Source program and it has a portable version. So you can always take it with you. You know by the time you go to repair your friends’ PC because of the same issue. 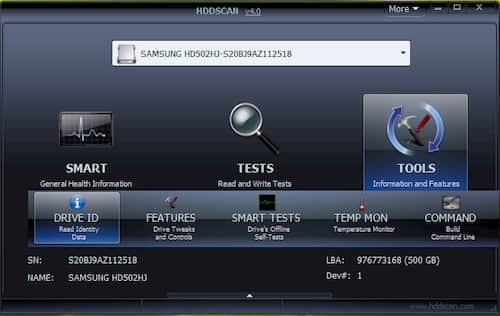 The first thing that strikes the attention of HDDScan is that it is a program that does not require installation. So you can also take it on a USB stick and run it directly on any computer. The interface seems removed from ten years ago, but as a tool is one of the best you can find. Especially for options such as the graphics, this shows you after the surface scans. It warns you about excesses of temperature. Shows you the SMART and puts at your disposal several tests of verification, reading, and deletion of data. It also analyzes the Conveyance or transport damage, perfect for when you send a hard drive by mail or you bought it in a store. The only thing you have to keep in mind is that you should try not to run your scans while you have other applications open that are using the hard drive. If you are a person without too much technical knowledge who wants easy to understand visual analysis. EASIS Drive Check is possibly the application of this list that you like the most. It is so simple that executing it will only give you two options. One is to Perform a SMART value analysis or a surface test. The first will only take a few seconds and will show you the data as you see in the image. Very visually with areas in red to tell you the factors in which you may be lagging. The surface is much more comprehensive and will take at least two hours. But you will know in detail if you have any defective sector. HD Tune offers the possibility to perform a graphical analysis of the internal or external behavior of the hard disk, analyze the bad sectors, SMART and sample the hours of ignition as well as a lot of other general information. It also measures the temperature and in fact puts an icon on your toolbar that shows you at all times the one on your hard drive. Unfortunately, the free version has been discontinued for several years. So if you want better results you will have to pull a PRO version (that of the capture) whose license costs 25 euros. Even so, it has a Free Trial with which we can perform quick scans. It does not have complicated graphs or metrics that you will not be able to read. But it does include a reading and writing test so you can know how it is performing. Come on, if you’re not a computer expert and you settle for knowing if the thing is good you have more than enough. 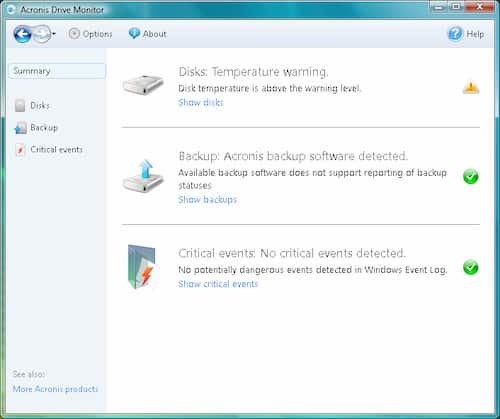 Do not be fooled by the stale appearance of the Acronis Drive Monitor interface, because although the former is not an advanced tool. It is possibly one of the easiest to understand on the list. On the main screen, you will be shown your discs and their state of health, with an overview of the temperature, a general note of your health and the time it has been running. Besides, you have two other tabs where you can easily see the SMART parameters and an event tab for any errors that may exist. On the side of the left, you will have the vision of the app. A Backup section in case you have downloaded the Acronis application for backup copies and a list of errors or critical events. And we finish with the simplest yet, because HDD Health is a simple monitoring tool that will be working quietly in the background with an icon in the toolbar that. When you hover over it, will teach you in a pop-up the health status of your hard drives. Double-clicking on this icon will open the application with visual indicators of health and temperature. In the drive menu, you will have the option to analyze its SMART parameters. You can also activate alarms for when there is little space or hard disk health be under minimum. 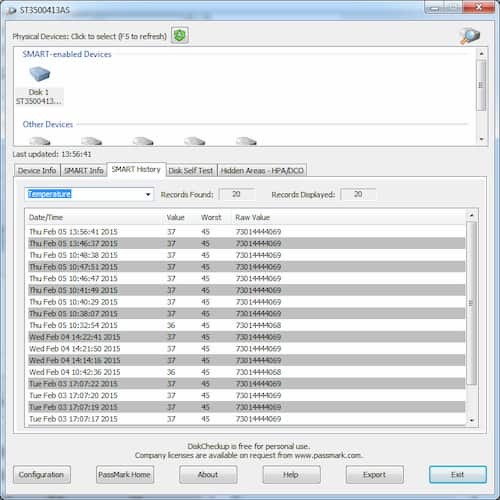 See a list with all the extended information with the data of each one of your discs. Hence, These are the best 7 tools to check hard disk health. 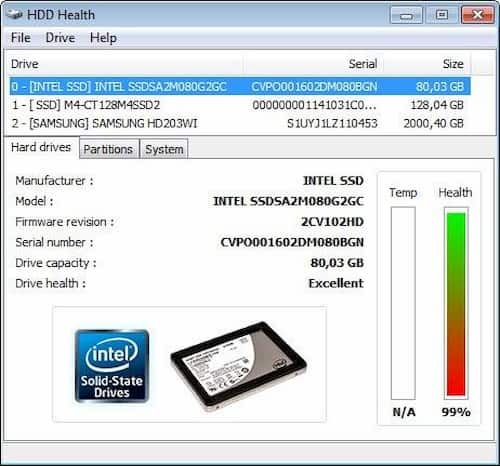 You can download any of the above tools and start checking the health of the hard disk. We hope you like this article and willing to share the article with friends and families. Free free to ask your questions in the comment box below. Stay tuned to Basictricks for more awesome articles. Download Snapchat for PC, Computer (Windows 7/8) Guide. How to Increase your Website Traffic Instantly?